While Gordon Brown and Alistair Darling spin the numbers announced today saying that we’re emerging from recession faster than we first thought (original estimates for UK Q4 2009 GDP were +0.1%), in real terms the revised numbers showed that the UK was worse off. Brown and Darling (when they are not fighting) would love us to believe that they are masters of the Universe and economic masterminds. However, as is clear to see, the UK’s recession was actually deeper than first thought and the GDP £133million lower in 2009 than first estimated. What is even more sickening is that the Office for National Statistics (supposedly independent and NOT prone to Labour’s spin) themselves titled their revised statistics as: “Services growth in December pushes up GDP estimate”. Unfortunately for everyone in the UK, that is simply not true. The UK was the last G20 country out of recession and one of the first in. 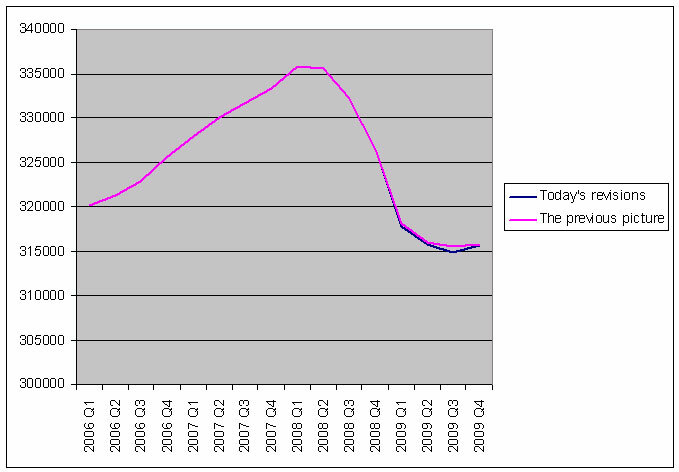 We can now clearly see the damage done (around -5% in GDP in 2009). One slightly positive that can be taken from the above is that the rate of recovery would now appear faster, rather than a flat-line stagnation. Fingers crossed!